"Vagues d'Amour" is a musical journey of 65 mn from ocean meditations for a total well-being lulled by the waves, the song of the sirens and gentle soothing melodies which fill up the heart and provide an infinite calm. Let yourself be carried by the waves of love, embark upon for a serene and luminous journey to radiant horizons and travel to a ocean of absolute fullness. We are pleased to make you discover it on Radio PLENITUDE, every day, from november 04 until december 03, before it enters in a regular programming. 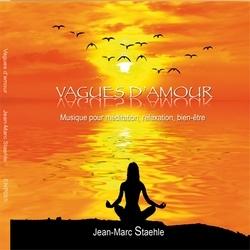 "With Vagues d'Amour, Jean-Marc Staehle transports us with sweetness and serenity at a bright and peaceful horizon where the fullness is expressed from the beginning of the album and moved throughout listening. An essential album of this autumn 2015 to pause and let interiorly express the wellbeing, relaxation, meditation, peace of heart and mind."